Grizzly Gear Brand-25 Feature Emergency Survival Kit is a water tight kit full of all the essential supplies to ensure survival. The kit fits easily into a backpack to take camping, fishing, hunting or hiking. 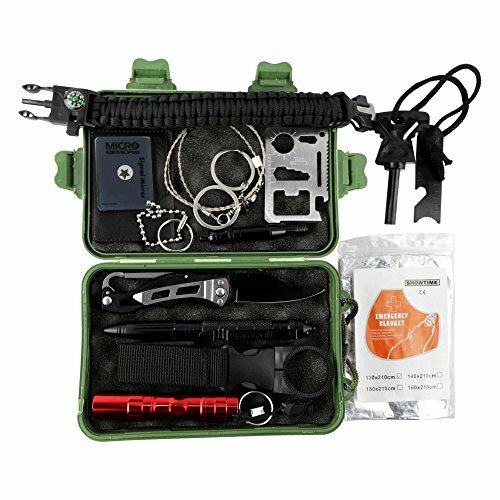 Kit includes stainless steel folding knife, 11 in 1 multi-tool, 5 in 1 paracord bracelet, signaling whistle and mirror, fire starter, survival blanket and tactical knife for breaking glass or in self defense. ESSENTIAL SURVIVAL KIT ~ Packed with all the items you need to aid in your survival or simply enhance your next camping, hiking or climbing excursion. Included in this water tight kit are-Stainless Steel Folding Knife, Signaling Mirror, Wire Saw, Mylar Blanket, Magnesium Fire Starter, 11 in 1 Multi-tool, LED Flashlight (battery not included), 5 in 1 Paracord Bracelet with Compass, and Signaling Whistle. PREMIUM KNIFE WITH EASY CARRY CARABINER ~ Ultra-sharp knife, stainless steel folding knife that carries easily by hooking on a belt loop for easy access. 5 IN 1 PARACORD SURVIVAL BRACELET ~ Multi-use parachute cord bracelet with fire starter, whistle, knife blade and compass to guide you out of the deepest wilderness and back to civilization. EMERGENCY MYLAR BLANKET ~ Keep warm on those cold nights or use the reflective surface to signal for help. 100% SATISFACTION GUARANTEE ~ If you are not 100% satisfied with this product, please return it-no questions asked! If you have any questions about this product by Grizzly Gear, contact us by completing and submitting the form below. If you are looking for a specif part number, please include it with your message.